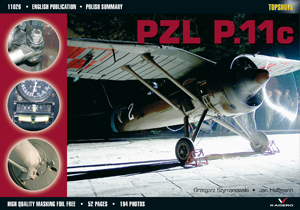 Poland’s most famous fighter aircraft, PZL P.11c, was designed by a team led by Zygmunt Pulawski. The talented designer perished in a flying accident before the first prototype was completed (in 1931); his ideas were further developed by a fellow engineer Vsievolod Jakimiuk. The variant P.11c, which followed P.11a and P.11b (export version), was so different from its predecessors that in fact it could be viewed as a completely new design. The production run, started in 1934, reached 175 aircraft and terminated in 1936. These aircraft were in constant service with the Polish fighter arm, and so in September 1939 they were already well worn out. Furthermore, at the outbreak of WWII, the entire class to which P.11c belonged was already obsolete (although highly manoeuvrable, it couldn’t compete with modern fighters, nor even bombers, in terms of speed). Nevertheless, P.11c was a mainstay of the Polish Fighter Force. There were 115 airworthy P.11c’s on strength by 1st September 1939, plus further 38 in reserve or undergoing repairs. Of the latter, four were rushed into service with the frontline units. Overall, 116 aircraft of the type were lost during the war in Poland, including 97 in combat; 37 aircraft were flown out of Poland to Romania and the Soviet Union. The pilots flying the P.11c and the older P.11a claimed a total of 135 aerial victories. Even though according to German sources this number was more likely to be 93, such a score was by all means a noteworthy achievement in the face of qualitative and quantitative superiority of the enemy. The PZL P.11c preserved in the Polish Aviation Museum in Krakow features factory number 562 (serial number 8.63) and comes from the first series manufactured by PZL plant at Okecie-Paluch in 1935. It mounted PZ Skoda-Bristol Mercury V S2 radial engine rated at 565 hp (max. 600 hp) produced in Poland under licence; the aircraft of the later production run were fitted with a more powerful Mercury VI S2 engines producing 590 hp (max 630 hp). This machine was rigged with four 7,9 mm machine guns (two on fuselage sides, synchronized with the propeller, and two in the wings) and a radio set (unlike many others). It was issued to the 121st Fighter Squadron, 2nd Fighter Wing, which was stationed in Krakow. The aircraft was coded “2” on the fuselage and “39 K” on the bottom surface of the wings. The aircraft saw combat in September 1939. It was the only machine in its squadron armed with four machine guns, and it was probably flown, among other pilots, by the Polish Air Force future ace ppor. (P/O) Waclaw Król (although offically assigned the aircraft coded “8”, he didn’t fly it). It is also believed that kpr. (LAC) Tadeusz Arabski flew this very machine when he shot down a Dornier Do-17 bomber (albeit the renowned Polish historian J. Cynk mantions this claim as ‘probable’). The slightly damaged aircraft was captured by Germans, who came into possession of at least two machines of this unit: one flown by st. szer. (RAF’s Leading Aircraftman, USAF’s Airman) Marian Futro and the other by ppor. Chciuk. The machine presented in the following photographs is likely to be one of those two. Germans overhauled the aircraft and put it on display in Berlin’s Air Force Museum. After numerous Allied bombardments of Berlin, which damaged the museum, the remaining exhibits were evacuated further east to the Wielkopolska province (namely to Czarnkow), where the aircraft was discovered in 1945. It was subsequently stored in Gaskow, Pilawa and Wroclaw, whereupon in 1964 it was presented to the Museum of Aviation and Astronautics (the present Polish Aviation Museum). Initially it was put on display in the incorrect painting scheme applied by Germans, which featured red and white checkers on the rudder and wings, red and white propeller spinner and the name of the type painted on the fuselage. With time, the scheme was partially corrected (the spinner). In the nineties the entire airframe was painstakingly reconstructed and its original looks recreated (as for now with the sole exception of wheels). The Museum staff re-equipped the aircraft with fake guns and even managed to repair the engine to the running condition. 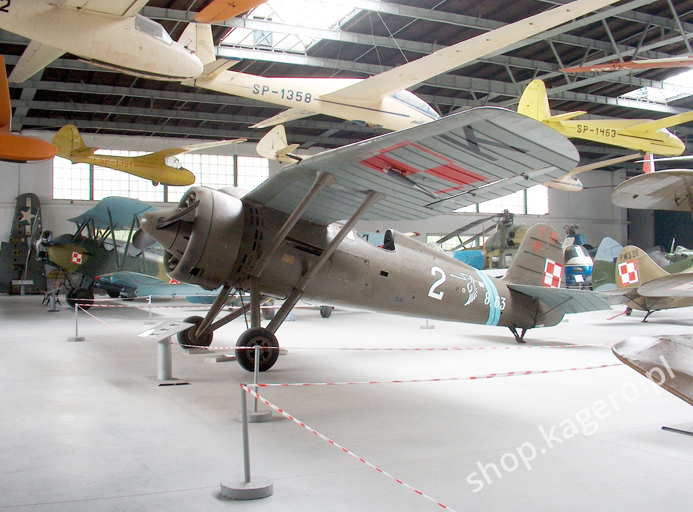 Being the only survivor of its type, the Krakow Museum’s PZL P.11c is truly a treasure.